The beta version of the SOFTIMAGE 4D Creative Environment made its debut at the 1988 SIGGRAPH show, and SOFTIMAGE Version 1.0 was released in January, 1989. A basic SOFTIMAGE software package is priced around $34,000; the full-blown system may cost up to $56,000 for the software alone. Last summer, James Cameron’s Terminator 2 was widely hailed for revolutionizing the use of computer animation in the production industry- at a cost of about $80 million. 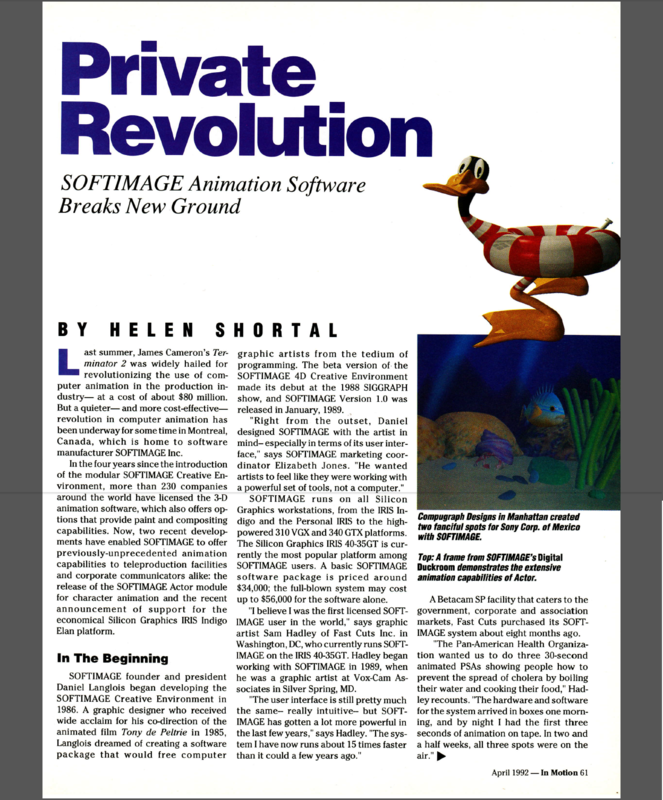 But a quieter- and more cost-effective revolution in computer animation has been underway for some time in Montreal, Canada, which is home to software manufacturer SOFTIMAGE Inc.
SOFTIMAGE founder and president Daniel Langlois began developing the SOFTIMAGE Creative Environment in 1986. A graphic designer who received wide acclaim for his codirection of the animated film Tony de Peltrie in 1985, Langlois dreamed of creating a software package that would free computer graphic artists from the tedium of programming. The beta version of the SOFTIMAGE 4D Creative Environment made its debut at the 1988 SIGGRAPH show, and SOFTIMAGE Version 1.0 was released in January, 1989. SOFTIMAGE runs on all Silicon Graphics workstations, from the IRIS Indigo and the Personal IRIS to the highpowered 310 VGX and 340 GTX platforms. The Silicon Graphics IRIS 4G35GT is currently the most popular platform among SOFTIMAGE users. A basic SOFTIMAGE software package is priced around $34,000; the full-blown system may cost up to $56,000 for the software alone. “I believe I was the first licensed SOFTIMAGE user in the world,” says graphic artist Sam Hadley of Fast Cuts Inc. in Washington, DC, who currently runs SOFTIMAGE on the IRIS 4G35GT. Hadley began working with SOFTIMAGE in 1989, when he was a graphic artist at Vox-am Associates in Silver Spring, MD. “The user interface is still pretty much the same- really intuitive- but SOFTIMAGE has gotten a lot more powerful in the last few years,” says Hadley. “The system I have now runs about 15 times faster than it could a few years ago.” A Betacam SP facility that caters to the government, corporate and association markets, Fast Cuts purchased its SOFTIMAGE system about eight months ago. Designed to provide artists with flexibility as well as creative freedom, SOFTIMAGE can output images at multiple resolutions to a wide range of formats,, including NTSC, PAL, HDTV, 35mm film and 4 X 5 transparencies. Both technical support and services for SOFTIMAGE users are available through the Customer Support Department at SOFTIMAGE headquarters in Montreal; its services include rendering and outputting to both film and video. With the PostScript option, SOFTIMAGE can also output line work to Post- Script-compatible printers, for applications such as storyboards or conventional cel animation. This versatility has contributed to SOFTIMAGE’s popularity as a tool for architectural and industrial design, education and scientific visualization. At Northern Telecom lnc. in Research Park, NC, animation director and marketing specialist Paul Graham uses SOFTIMAGE to produce “everything from brochure covers and videos to high-res images for trade show display panels,” says Graham. Running on a Silicon Graphics 310 VGX workstation, the SOFTIMAGE system at Northern Telecom includes the Nefertiti paint program and the Eddie compositing module, which provides in-computer integration of live action and special effects. “SOFTIMAGE lets me do everything Irom logo spinning to visualizing the concepts behind the services we market,” says Graham, who is particularly impressed with SOFTIMAGE’s Wave module. 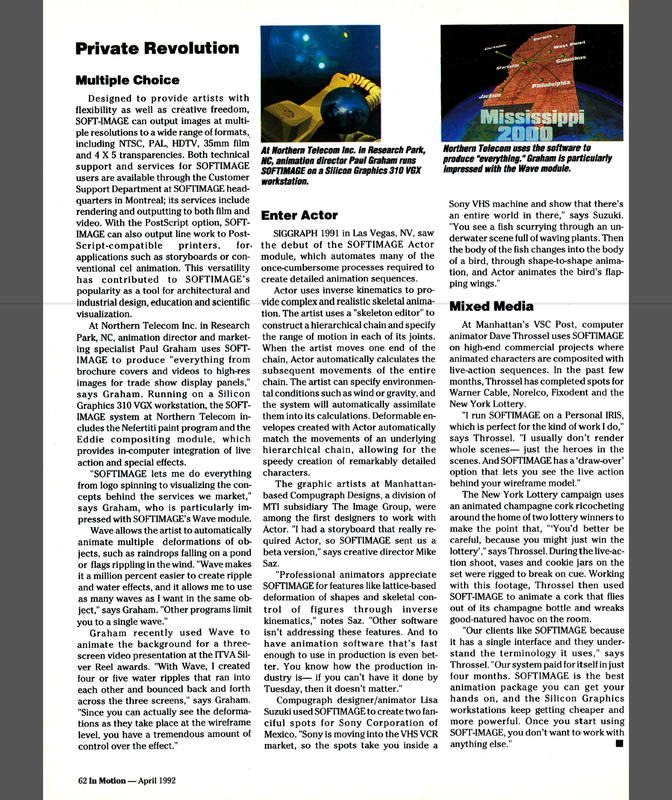 SIGGRAPH 1991 in Las Vegas, NV, saw the debut of the SOFTIMAGE Actor module, which automates many of the oncecumbersome processes required to create detailed animation sequences. Actor uses inverse kinematics to pre vide complex and realistic skeletal animation. The artist uses a “skeleton editor” to construct a hierarchical chain and specify the range of motion in each of its joints. When the artist moves one end of the chain, Actor automatically calculates the subsequent movements of the entire chain. The artist can specify environmental conditions such as wind or gravity, and the system will automatically assimilate them into its calculatiens. Deformable envelopes created with Actor automatically match the movements of an underlying hierarchical chain, allowing for the speedy creation of remarkably detailed characters. The graphic artists at Manhattanbased Compugraph Designs, a division of MTI subsidiary The lmage Group, were among the first designers to work with Actor. “I had a storyboard that really required Actor, so SOFTIMAGE sent us a beta version,” says creative director Mike Saz. At Manhattan’s VSC Post, computer animator Dave Throssel uses SOFTIMAGE on high-end commercial proiects where animated characters are composited with live-action sequences. In the past few months, Throssel has completed spots for Warner Cable, Norelco, Fixodent and the New York Lottery. The New York Lottery campaign uses an animated champagne cork ricocheting around the home of two lotterywinners to make the point that, “‘You’d better be careful, because you might just win the lottery’,” says Throssel. Duringthe liveaction shoot, vases and cookie jars on the set were rigged to break on cue. Working with this footage, Throssel then used SOFTIMAGE to animate a cork that flies out of its champagne bottle and wreaks good-natured havoc on the room.